Small - $53.99 Medium - $53.99 Large - $53.99 Only 8 left! Every kid knows that when the Caped Crusader sets out to do something, he doesn't stop until it's done. And, now Batman has got a beef with Superman, so he's going to see just how "super" that Kryptonian really is! 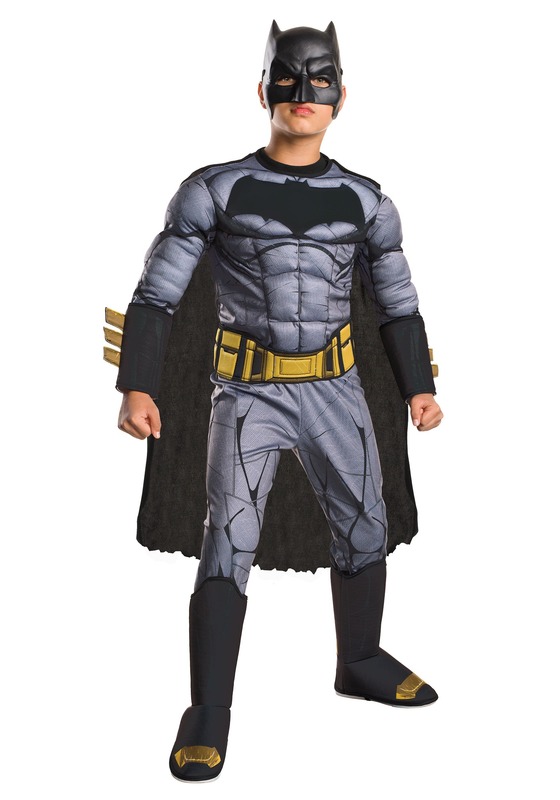 Your kid can look just like the Bat in this awesome Deluxe Dawn of Justice Batman Costume, and go toe to toe with the Man of Steel, like in Batman V Superman: Dawn of Justice! The Dark Knight is well known for his high tech gadgets, his martial arts expertise, and his keen analytical mind. He's totally going to need all of those things when he squares off with Superman, but will it still be enough? Well, one thing we've learned over the years of watching Batman work is to never doubt him. He's always got a trick up his sleeve! It also doesn't hurt for him to wear a suit of state of the art armor and do some extra push ups before the fight, though... we hear the Man of Steel punches pretty hard. Luckily, the foam padding muscles on this cool deluxe jumpsuit will make your little crime fighter look as tough as Batman! It's also printed with the same details as the suit he wears in the movie, and comes with foam boot covers, a cape and a Bat-mask to give him the Dark Knight's fearsome appearance. Even Superman will think twice before fighting this little action hero!